Simply Baked Jumbo Paper Baking Cups aren't just for baking...they are the ideal accessory for elegant entertaining every day! perfect for sweet treats such as strawberry shortcake, berry crumble or an ice cream sundae or a generous single serving of savory foods like mac-n-cheese, chili, salad and more. they aren't just for baking. Ideal for appetizers, such as nuts, olives or veggies and dip. You can also use them to decorate around the house or group several together as a center piece at a large event. They are water tight so use them for mini floral arrangements. our paper products come in a range of styles and an array of coordinating, eye-catching patterns and colors. Pick one design for a theme party or mix and match to your heart's content. Whether you are planning a wedding, birthday party or just gathering for tea on the back porch, bring a smile to those around you by transforming any occasion into a memorable event. 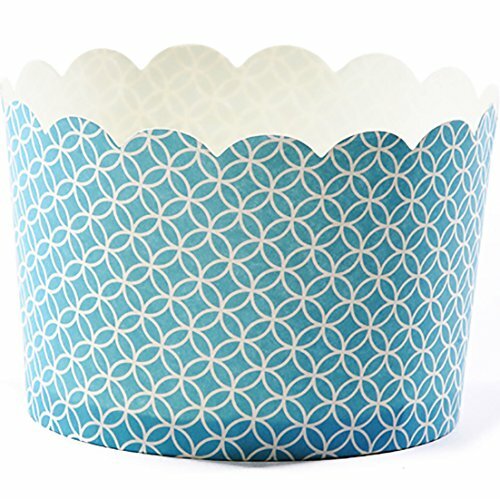 The jumbo paper cup measures 3.5" diameter by 2.375" High and holds up to 8 oz. All simply baked paper cups have an FDA approved, food safe coating that eliminates any need for pre-greasing; they are oven safe up to 375-degrees and disposable. When baking, fill the cup half way with batter, place on a baking sheet with space between the cups so heat can circulate and then pop them in the oven, there is no need for a cupcake pan. for a striking presentation, display your special treats on the simply baked three tier stand. Simply baked started with two entrepreneurs, a belief in artful entertaining and a baking cup. Since then, we have become a leader in stylish, affordable and distinctive products for elegant entertaining every day. here at simply baked we believe in giving back. We support many children's causes and employ special needs individuals from our community of bend, or. We also make every effort to support domestic production and hire local professionals. We hope you like our philosophy. We appreciate your generous support.